In the interest of science, I have decided that another experiment should befall our favorite unwitting subject, P. In traditional M manner, I have chosen to find the thresholds of annoyance. Of course, I would never do such a thing solely for my own amusement, this is for the betterment of mankind ( I don't know how yet, but I'm sure it has to be ). "You appear to be connected to the internet"
"I see that you have been using your mouse"
"Your computer seems to be turned on"
"Background processing has rated your typing speed to be below normal"
As for our first day, Clippy has been set to pop up every minute, and so far has elicited such gems as "I F&%*ING KNOW! Why is this thing telling me this!" "I HATE YOU!!" and "I think he's out to get me"
Priceless. How long will this last? We shall see. Holy crap. Now just hook up a mic so we can listen to these reactions... PLEASE! Aaah... good to have you back. That clippy link has made my day. People are going to hate it and it's going to be great. Oh and you can CUSTOMIZE the things it says? Dude, do THAT! With P.'s name or something. 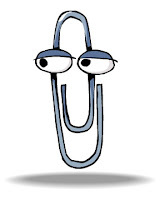 Haaaa, I downloaded Clippy onto my own computer just for fun. I removed it after about four minutes. This was AMAZING! I used this joke on one of our sales guys at the radio station I work at and talked about it on air... CLASSIC!